The AD7863 is a high speed, low power, dual 14-bit Analog-to-digital converter that operates from a single 5 V supply. The part contains two 5.2 s successive approximation ADCs two track/hold Amplifiers an internal 2.5 V reference and a high speed parallel Interface Four Analog inputs are grouped into two channels (A and B) selected by the A0 input. Each channel has two inputs (VA1 and VA2 or VB1 and VB2) that CAN be sampled and converted simultaneously, thus preserving the relative phase information of the signals on both Analog inputs. The part accepts an Analog input range of 10 V (AD7863-10), 2.5 V (AD7863-3), and 0 V to 2.5 V (AD7863-2). Overvoltage protection on the Analog inputs for the part allows the input voltage to go to 17 V, 7 V, or +7 V respectively, without causing damage. A single conversion start signal (CONVST) simultaneously places both track/holds into hold and initiates conversion on both channels. The BUSY signal indicates the end of conversion and at this time the conversion results for both channels are available to be read. The first read after a conversion accesses the result from VA1 or VB1, and the second read accesses the result from VA2 or VB2, depending on whether the multiplexer select (A0) is low or high, respectively. 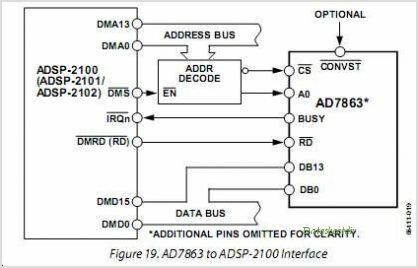 Data is read from the part via a 14-bit parallel data bus with standard CS and RD signals. In addition to the traditional dc accuracy specifications such as linearity, gain, and offset errors, the part is also specified for dynamic performance parameters including harmonic distortion and signal-to-noise ratio. The AD7863 is fabricated in the Analog Devices, Inc. linear compatible CMOS (LC2MOS) process, a mixed technology process that combines precision bipolar circuits with low power CMOS Logic It is available in 28-lead SOIC_W and SSOP. 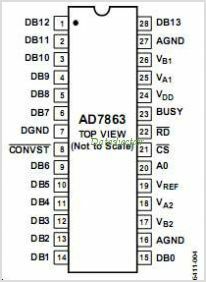 This is one package pinout of AD7863,If you need more pinouts please download AD7863's pdf datasheet. This is one application circuit of AD7863,If you need more circuits,please download AD7863's pdf datasheet.